The US Congress should amend outdated labor laws that allow even young children to work in commercial US agriculture, Human Rights Watch said today. Legislation introduced today by Congresswoman Lucille Roybal-Allard of California would for the first time apply the same age and hour requirements to children working in agriculture as for children working in other occupations. Hundreds of thousands of children under age 18 work in US agriculture. 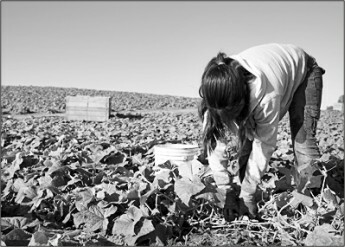 In states including Florida, Texas, North Carolina, and Michigan, Human Rights Watch has found that child farmworkers work longer hours, at younger ages, and under more hazardous conditions than other working youths. This summer, Human Rights Watch interviewed children hoeing cotton and sorghum in scorching heat, cutting collard greens and kale with sharp knives, hitching and driving tractors, and stooping for hours picking cucumbers. Pay was, at best, minimum wage, but was often far lower. Many employers provided no drinking water or toilets. Children described smelling and, in a few instances, being sprayed with pesticides. Many left school in April or May, or were still working elsewhere when their schools started in August. "Children as young as 11 and 12 are working 10 or more hours a day in one of the country's most dangerous occupations," said Zama Coursen-Neff, deputy director for the Children's Rights Division at Human Rights Watch. "It's time to update antiquated laws and make sure that children harvesting food in the fields receive just as much protection as the teens serving that food at McDonald's." Agriculture is one of the most dangerous types of youth employment in the United States. In 2000, the Department of Labor reported that the risks of work-related fatalities for youth working in agriculture were four times as high as the average for all working youth. The Roybal-Allard bill, the "Children's Act for Responsible Employment (CARE)" would amend the Fair Labor Standards Act to prohibit the employment of children ages 13 and younger in agriculture, except for those working on farms owned and operated by their parents. It would allow 14- and 15-year-olds to work only for limited hours, outside of school hours, and would raise the age for hazardous agricultural work to 18. Currently, under the Fair Labor Standards Act, any agricultural employer can hire children ages 12 and 13 to work unlimited hours, outside of school hours with parental permission. On small farms, there is no minimum age for children who work outside of school hours with their parents' consent. In contrast, employers outside of agriculture are prohibited from hiring children below age 14, and can employ 14- and 15-year-olds for no more than 18 hours in a school week, and not more than 40 in a non-school week. No such restrictions apply to children working in agriculture. "The long hours and low wages of child farmworkers undermine their education and perpetuate cycles of poverty," Coursen-Neff said. "US practices also violate international law." In 1999, the US ratified the International Labour Organization's Worst Forms of Child Labor Convention, which prohibits work that is likely to harm the health, safety, or morals of children. The guidelines that accompany the convention recommend that prohibited forms of child labor include work with dangerous machinery, equipment or tools, and exposure to hazardous substances and temperatures. In a letter sent on September 15, Human Rights Watch urged members of the House of Representative's Committee on Education and Labor to support the bill and act quickly to ensure its passage. Roybal-Allard announced the introduction of the bill in advance of a September 16 US Department of Labor event focusing on the plight of migrant farmworker children. Labor Secretary Hilda Solis is the host.